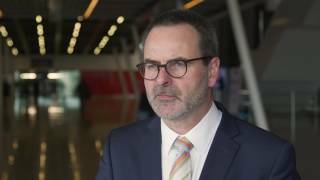 EAU 2017 | What is a semi-live surgery masterclass? 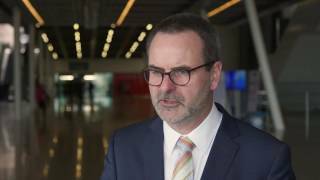 Peter Albers, MD, from the Heinrich-Heine-University Düsseldorf, Germany, discusses the concept of a semi-live surgical masterclass at the European Association of Urology (EAU) conference 2017 in London, UK. He says that this new format has been introduced in surgical education across disciplines over the past few years. Prof. Albers explains that the for a semi-live masterclass, a live surgical procedure is videotaped, and this video is brought to the presentation, and discussed with other presenters, typically comparing different techniques for carrying out a specific procedure, such as anastomosis. An advantage of the semi-live approach is that techniques can be demonstrated without putting patients in danger. Prof. Albers also mentions the disadvantage of this approach, primarily that typically a “perfect” surgery without complications is show. At the EAU conference, Prof. Albers chaired a semi-live masterclass comparing different techniques of robotic prostatectomy, as well as hernia repair during this procedure. Prof. Albers argues that the semi-live approach is an excellent opportunity to educate people and promote discussion on surgical techniques. Robot-assisted surgery – what are the advantages for clinicians and patients?